It all started due to a bar conversation in 2009 with a Welshman and now good pal – Marcus Leach – while watching rugby one Saturday morning at the “Jollyboys” backpacker hostel in Livingston, Zambia. After a time traveling together, we parted ways, but he later informed me of his climb of Mt. Kilimanjaro in Tanzania and recommended I follow suit – which I ultimately did. I enjoyed the climb, but didn’t give it much second thought until later on that same world trip, I found myself in Nepal and trekked to Everest Base Camp (2010). Safe to say, I was now starting to truly feel the call of the mountains. I returned to work in 2010 and while happy to once again have a paycheck after my two-year hiatus, I craved adventure. Another pal suggested Aconcagua – in Argentina, the highest mountain in South America. Seemed like a logical next step and not too crazy an idea. Having had luck with both health and weather on Kilimanjaro, making it a most enjoyable first foray in the hills – I was sorely disappointed when we were forced down from Aconcagua after only managing a carry to camp 2 before storms came in and ruined the trip. Disappointed, but determined. That stubborn streak I apparently inherited from Dad kicked into overdrive. This mountain wasn’t going to have the final word. In 2013 I decided to try my hand at Mt. Elbrus – Russia, the highest mountain in Europe (although many true “Europeans” might disagree!). This was my first time on crampons – ever – and while many folks seem to rank this as an easy climb – my experience has been nothing but. Summit day is approximately 6,000 feet up and down (give or take) – a long day by any standards – and while I was going great, this novice climber neglected to eat and drink sufficiently and by the time I reached the saddle (point before the final part of the ascent), I was seeing tunnel vision and called it a day, deciding that this remote part of Russia, between the Black and Caspian seas was not where I wanted to possibly test my health insurance coverage! Later that year, I returned to Aconcagua for round 2 – this time it was personal, as they say! I felt great, the team worked well together – and we got our summit bid – only to have a team-mate collapse on the Canaleta due to sudden and massive cardiac arrest, sadly passing away. I have never felt more useless in my whole life, and the team turned around with heavy hearts and teary eyes. By now, I was truly starting to think about the Seven Summits challenge – i.e. the highest mountain on each continent – but figured I would just take them one at a time, gauge my comfort level after each – and see if I would and should continue. In 2014 I flew to Talkeetna, Alaska to climb Denali – the highest mountain in North America. This was to be the adventure of a lifetime, flying on to the glacier at 7800 feet was like being dropped right into your very own Discovery Channel show. Each day the views were more incredible but Denali was quick to remind you that it was beautiful, but harsh. The days were spent in toil – mostly either freezing or roasting – and rarely in that Goldilocks “just right” zone! Climbers started to drop out as we got further up the mountain – and we ended up with 3 of 6 original climbers, stuck in yet another blizzard at high camp (17,200 feet), which ultimately moved out, but not before dumping so much snow as to make traversing the autobahn too perilous due to avalanche hazard. Yet ANOTHER “nearly”!!! As my pal and climbing mentor Craig John told me – “You know partner, it most definitely is about the journey – but if you don’t start making the destination soon, you’re just a guy who likes walking in the hills“!! I’d take this from him – and him alone – as he understood, and shared my frustration at this seemingly unending run of bad luck. Christmas 2014 was spent licking my wounds and taking the pressure off – going on a trip with my then girlfriend and now wife Stefanie, climbing Mt. Kilimanjaro for the second time (her first). Being both athletic and outdoorsy, she had wanted a taste of what an expedition was like – and this seemed like a great way to introduce her to my hobby. Happy to say that despite some waning energy near the summit, we made it to the top – and spent a few great days defrosting on the beaches of Zanzibar afterwards. Nice to spend time in the hills with no pressure in the back of my mind. 2015 was a very different year, for many reasons. I had planned a return to Denali almost upon my descent from high camp the previous year – and this was already bought and paid for – planned for July 2015. Then in March – my entire world was turned on its head when I received a phone call from home (Dublin, Ireland) from my sister, to tell me that Dad had collapsed, was in the hospital and the doctors were fighting to ave his life. He had kidney disease – and had suffered full renal failure, the most extreme version of End State Renal Disease (ESRD). Since 2007, Dad had spent his time in retirement caring for our mother – who had suffered a debilitating brain hemorrhage while on vacation. What is now sadly apparent is that while caring for Mum, Dad had neglected to look after his own health. To be honest, he and I never had the best relationship when I was growing up – and by the time I had finished college – Dublin wasn’t a big enough town for both of us and Ireland wasn’t a big enough country – so with green card in hand, I leapt at the opportunity to move to the U.S. in 1996. We had an uneasy truce for several years, but when mum had her stroke – our mutual love for her brought the two of us closer for the first time in years. I flew to Spain to help him get mum home and I remember one conversation very well – we were standing on the hotel balcony having some dinner after a day sitting with mum – where I assured him that despite our differences, I would come running to help him just as quickly as I had for mum. Over the years since then, he and I grew our bond through his seemingly living vicariously through my adventures in the mountains – and while far from perfect, there was a detente in our relationship. Keeping my word from Spain, I flew home to be with him and spent the next 2 months there, until he had stabilized and was back home and on dialysis. This was another eye-opener for our family – not realizing the severity of the treatment and its impact on the body. For those of you who do not know – dialysis is basically the equivalent of chemo with out the hair loss. Dad was exhausted upon return each of the three days a week he went for dialysis – and had less and no energy whatsoever. When he started to show signs of making some progress, I finally returned to NY where my job and life waited. It seemed that the worst was over and while far from perfect, that the doctors had things under control. Later that summer, I returned to Talkeetna once again in the hopes of this time summiting Denali – but hours before getting on the flight to the base camp glacier, I was sharing a tear-filled phone call with Dad and family, trying to decide if I should return to Dublin immediately. Despite my aunt’s concerns, Dad insisted that he was ok, that I stay and climb, and that he would most certainly still be alive upon my return. True to his word, he was – frail, but alive – and we celebrated a summit, at last – a damn summit!!! We postulated that maybe this was going to be the beginning of a lucky streak. In August of that year, I planned on killing two birds with the one stone – first returning to Russia for a long-overdue round 2 with Elbrus, and since already over that way, follow-up with a trip home to see my family and eagerly see how both Mum and Dad were doing. 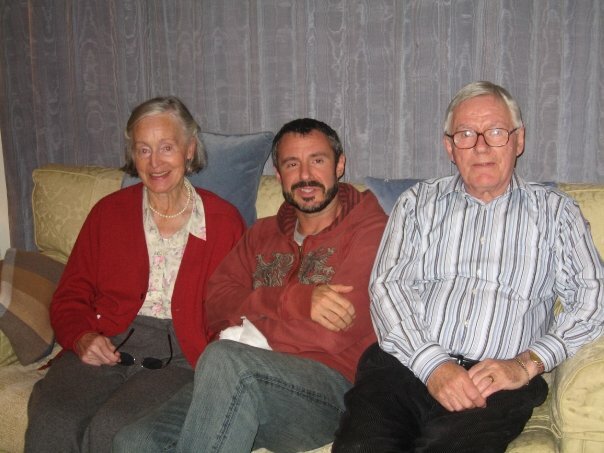 Let’s start with the good part of the this trip – both Mum & Dad, whilst still frail, were doing ok. The bad news – we all made it Elbrus in great spirits and great form – and it seemed like everything was pointing towards a good summit day and with luck another summit. That was, of course, until the entire hut was struck with a 24-36 hour stomach virus from likely improperly filtered water. I headed out on summit night with my stomach moaning and complaining and had already thrown up before we had even left camp, and twice more before we had made it another 1,000 feet. Reluctantly, but unavoidably, I had to turn around. As with Aconcagua – now another strike 2 – this time on Elbrus. Speaking of Aconcagua – I had decided on a third attempt that coming December and as usual, had booked the trip well in advance. In early November I returned home to be with family as Dad was once again back in hospital. After a brief period of improvement he now appeared to be regressing, and each day seemed just that bit weaker. My sister and I rotated the afternoon and evening visits and while he was weak, the doctors felt he would recover. On Thanksgiving Thursday we dropped into him as he was wrapping up dialysis and just before going to bed. He seemed so weak, but still managing to stay positive. We wished him good night and headed home, planning to return in the morning. Later that night we got a call from the hospital, and so it was, on the eve of his 75th birthday, Dad lost his struggle with kidney disease. Weeks turned into months and winter turned into spring – and I was once again back in NY and trying to get back to a normal semblance of life. I spent some weekends in NH getting back into a climbing groove and that’s when I first thought out loud about Everest, once again to CJ my climbing mentor, whom I typically run everything by first. He agreed it was time – and we got the ball rolling, with him doing the introductions to the Everest program director at IMG. First things first however – I still had unfinished business on both Elbrus and Aconcagua – having been on both of them twice before. So, with high hopes of cleaning up the ledger in my favour, I first booked a June trip back to Russia. Happy to report that third time was a charm – and despite a full-on whiteout on summit day, we managed to summit! At long last. Man, that felt good. September saw myself and Stef travel to Australia on our honeymoon – and managed to reach the top of Kosciuszko on a cold and snow-covered day. My fourth, Stef’s second. Things were starting to go my way… oddly – and I am not superstitious – since Dad’s passing. Perhaps the old man was just tired of listening to me talk about “nearlys” and now that he had a front row seat, was doing his best to ensure I made it to the top these last few times. I was going from strength to strength now – and with a few successful summits behind me – wanted to get back down to Argentina to give Aconcagua one last go before heading out to Everest. At just under 23,000ft, Aconcagua is the highest mountain outside of Asia – so it would not just be tying up a loose end – it would also be very good training. The weather frankly, did not cooperate much – as is often the case on Aconcagua, with high winds, blizzards and cold. But, day by day we inched up the mountain and ultimately put ourselves in a position to go for the summit one day when everyone else was unable – and after a hard day, the weather remained right on the good side of where it needed to be – we summited and made it back down. Number 5 was officially in the books. I can’t imagine Dad ever thought he would be dealt the hand he was – I know we certainly didn’t. He never really stood a chance against this disease – but I am so proud to honor his memory with the Gerry Condon Memorial Expedition, that his passing be the catalyst to raise funds for those who are climbing their own mountain – day in, day out – living with kidney disease. How apt that his death mean something and that in his passing, he helps people that otherwise might not get the care they need. I likely know Dad better now in death than I did in life – and that is a regret I must live with. I regret the conversations that we never had and I wish that he could see me attempt what I am about to do. I might even listen to his gruff advice! But more than anything, I simply want him to know – I am proud to be his son and to do this in his name. I can only hope that wherever he is… Dad has a smile on his face knowing that.